We need to yield to and rely on the Holy Spirit if we’re going to use tools like job descriptions in ways that get us beyond mere secular business practices. The Spirit provides the power that enables us to line up all we do with the basics of life in Christ for it is His role to direct our steps toward our Lord Jesus (Jn. 15:26). For job descriptions to accomplish an eternal purpose, we need the Holy Spirit. Some of the basics of life in Christ include the following as they relate to job descriptions. (If you scroll down to ‘Related Posts’ you will find articles about each of these basics.) Notice the Holy Spirit’s role in helping us toward this end. 1) Job Descriptions need to reflect our purpose to love God and love people, the Greatest Commandments. 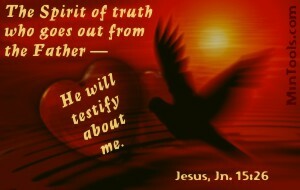 To get beyond mere intent written on a piece of paper, we need the Holy Spirit to work in hearts to generate such love. Handing people a job description with the expectation of alignment with this purpose needs to be coupled with constant prayer that they walk in the Spirit so their ministry bears the fruit of love for God and those they serve. 2) Job Descriptions need to align with God’s design for Body Life. If you leaf through job descriptions for various ministries, you should find quite a bit of diversity needed to effectively function according to God’s purpose and design for the Church. Without the Holy Spirit bringing unity out of such diversity, we’ll have a hard time serving interdependently with attitudes of humility that enable us to align with God’s design for the Church. We mustn’t rely on our own skills as leaders to unite people. 3) Job Descriptions should emphasize ministry, under the Lord’s leadership, no matter how task-oriented or behind-the-scenes the responsibility might be. Jesus’ Great Commission makes it clear that all believers serve under His authority. And, everyone should view their role as making disciples not just those with “outreach” or “disciple-making” in the position title on their job descriptions, nor just those with more upfront or people-oriented ministries. The Spirit enables us to take ministry to higher levels than simply the accomplishment of a task. 4) Job Descriptions must be used in ways that reflect Christ-like character. We must get beyond merely describing what people should do in their ministries to who they should be … Christ-like qualities, not just personal strengths. And, leaders must exercise Christ-like character in the development and use of job descriptions so as to arrive at God’s intent, not to merely accomplish an administrative task. Walking in the Spirit is our only guarantee of serving with God’s heart as reflected in Christ Jesus. 5) Job Descriptions shouldn’t be written in a way that suggests ministry happens through human effort. Jesus clearly stated that apart from Him we can do nothing of eternal value (Jn. 15:5) so it doesn’t make sense to write job descriptions as though the ministry depends on us. We need to pull on God’s power to speak His message and to do His will. The Holy Spirit enables us, helping us not only know what to do but how to do it. And, He then empowers us to accomplish it to the glory of God and the building up of His people. Clearly, ministry requires the power of the Holy Spirit to work within us as leaders and within those we recruit to serve within the Church. Let’s be careful not to quench the Spirit (1 Thess. 5:19), even in simple things like the writing and use of job descriptions. Rather, may they be tools of the Holy Spirit … that through which the Spirit is pleased to work.